Is 2014 the Year to Adopt AVB? IEEE open standard simplifies integration and interoperability. But are there limits? Beyond allowing multi-vendor AV components to be networked together over IP, AVB’s real claim to fame is its ‘Bandwidth Reservation’ feature. The merger between audiovisual technology and IP networks is no longer a forecast: It’s a fact. With this merging of technologies comes a demand for quick-and- easy component additions, set-ups, and management. Some AV technicians yearn for the now-past analog days when one device could be plugged into the other, and everything just worked. 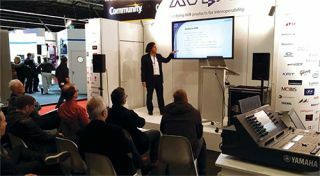 The Institute of Electrical and Electronics Engineers (IEEE) has already tackled the issue of IP-enabled, digitally based AV equipment integration, communication and control by creating the AVB set of technical standards. Short for Audio Video Bridging, the four AVB standards collectively support the deployment of multi-vendor two-way audio/video systems over IP, with minimal latency and jitter, and — most important of all — guaranteed connectivity between AV devices over their common LAN/WAN. Ongoing efforts to create and promote AVB-certified interoperable AV products are being spearheaded by the AVnu Alliance (www.avnu.org), It is an industry/installer group that includes heavy hitters such as Barco, Biamp, Cisco, Crestron, and Revolabs, among many others. At this point in time, vendors such as Extreme Networks and NetGear are offering AVB-compatible bridges (network switches), to allow existing wired networks to be converted to AVB compatibility and signal carriage. Many other AVB-enabled products are also available. The big question for AV Technology readers: Is 2014 the year to move their networks from proprietary architectures to open standard AVB — or not? That’s a question that can be answered on a case-by- case basis, using the AVB pros and cons insights offered here. Beyond allowing multivendor AV components to be networked together over IP, AVB’s real claim to fame is its “Bandwidth Reservation” feature. This is in addition to the “intelligence” of AVB-enabled bridges/switches, all of which have onboard software/firmware that handles network setup, configuration and management. In January of 2014, Crestron announced its membership in the AVnu Alliance. “Our commitment to standards makes us the perfect candidate to join the AVnu Alliance to ensure interoperability among networked AV devices and provide the highest quality streaming AV experience,” explained John Pavlik, Crestron’s director of architecture and design, in a company news release. The 2013 Ballet Russes exhibit at the National Gallery in Washington DC, “Diaghilev and the Ballets Russes, 1909–1929: When Art Danced with Music” was created using AVB-enabled AV components. The exhibit was not only a major success for the Gallery, the tech team felt confident in the flexibility and reliability of the AVB system. Meanwhile, Biamp has done “successful AVB installations at the University of Wisconsin-Eau Claire, the Birmingham Public School District (Alabama) and the Denver Museum of Science and Nature,” said O’Connor. The big issue for AV managers is whether to move to AVB or not, when it is time for a major network update/upgrade. From an ROI (return on investment) standpoint, “AVB capable chips are less expensive typically than proprietary chips, so theoretically there should be some cost savings,” said Steve Seable. But product cost is not solely dependent on a single piece of silicon. “There are many development factors that will weigh into the final cost of a product,” he added. Deciding for or against AVB is very much a case-by- case decision, governed by an AV/IT manager’s requirements and available budget. One thing is certain: for AV managers who want Reserved Bandwidth, easy installation, open standards, and easy scalability, AVB is the way to go. * Biamp’s Tesira is a group of digital signal processors that are configured to support AVB. The Tesira family line includes the Server (which can be deployed as a redundant pair), the Server-IO, and TesiraFORTÉ. Each one offers different networking capabilities for different installation environments. * Extreme Networks X440 Summit Series of switches were the first to be AVnu-certified. The Summit X440 series switches have redundant power supplies, SummitStack capability, comprehensive security and high-performance routing/switching. * Harman’s BSS Audio Soundweb London processors offer AVB in many of their models. These include the BLU-805 signal processor chassis with BLU link and AVB, and the BLU-325 I/O expander chassis with BLU link and AVB. * Meyer Sound’s CAL column array loudspeaker are now AVB-enabled. So is the company’s D-Mitri, a Gigabit network-based digital audio processing and distribution platform. * Riedel Communications has released a new card that provides AVB transport for Riedel Artist 1100 series control panels. The CPX-AVB card that fits into an expansion slot within the Artist 1100 series. This card makes the control panel AVB-enabled, allowing its ports to be used across within the entire AVB network. * Yamaha’s CL 1 audio console with 64 channel talker/listener supports AVB connectivity. So does Avid’s S3L live sound system and Avid Pro Tools 11. To allow media facilities to take advantage of the AVB standard in the monitoring realm, whether now or in the future, Wohler Technologiesis offering a new AVB Monitoring Option card for the company’s AMP2 Series modular audio/video monitoring solution, including the acclaimed AMP2-E16V system. Once the card and software update are installed on the AMP2 Series unit, AVB channels can be mixed, level-adjusted, and monitored alongside AES, SDI, analog, and other input types, and in the same fashion. The Wohler implementation of AVB is unique in that AMP2-E16V monitoring units already deployed in the field may be upgraded easily to support AVB. No additional dedicated system is necessary. Rather, as a result of the series’ modular design, users can add AVB support via a 100 Base-T Ethernet port and familiar RJ45 connection when needed. Just like any other module for the AMP2-E16V, the AVB card occupies a single card slot. Because users can add AVB inputs without losing any of their other inputs, they retain the full power and flexibility of their AMP2 monitoring systems. Each AVB Monitoring Option card decodes two AVB streams of eight channels each (IEC 61883-6 format), and these two streams must be locked to the same media clock. outputs or re-embedded within an SDI stream. Going forward, those Wohler customers who employ the AVB card will be able to update its firmware just as they would the firmware for any other I/O module.